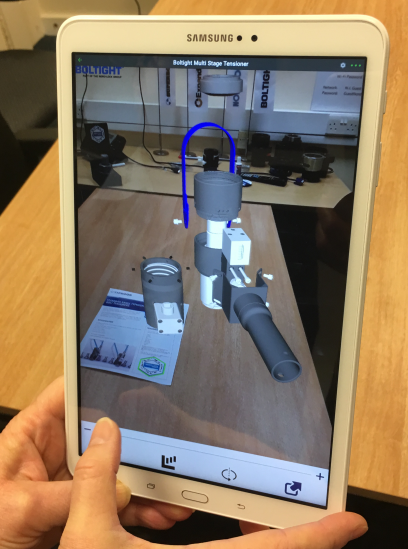 British manufacturer Boltight has taken its first steps towards digital transformation by embracing augmented reality (AR) to demonstrate its tooling functionality. As part of the global Nord-Lock Group, Boltight provides a one-stop shop for hydraulic bolt tensioning systems. It has begun trialling its first augmented reality experience, providing customers with a 3D experience for the wind segment of its Typhoon multi stage tensioning tool. Customers can enjoy a unique insight into the tool’s functionality and Boltight hopes it will lead to further AR innovation as the business exploits Industry 4.0 digital technology. Boltight’s Typhoon product is brought to 3D life by an innovative AR experience which provides customers with an exploded view of the tool. The user can view the virtual tensioner and place it onto a bolt on a virtual flange to check compatibility. With links to a datasheet, YouTube and the website, the experience also gives the user all the information they need to understand how the tool is used. The new AR experience will provide a valuable aid for Boltight’s sales and marketing teams. Sales teams can show customers how the tools would work while in-situ on site where it would not be possible to take actual tools. The detailed level of interactivity can offer customers a much better idea of product design and functionality, as well as giving access to a wealth of information at the touch of a screen. As the AR experiences are developed further, they will include installation instructions, manuals and e-learning. Boltight designs and manufactures an array of custom tools for customers around the globe and AR has the potential to let them check whether a given bolt tightening solution meets customers’ requirements without holding the physical product. Other potential with AR experiences is to include AR when designing new products so they are more interactive and it is easier to explain the proposed technology. Boltight can create experiences which will allow customers to see how bolt tightening solutions might be positioned within large infrastructure projects. For instance, Boltight’s Typhoon tool is widely used within the wind sector and by basing an AR experience within a virtual turbine, customers could take a 3D tour and see just how these tightening solutions can be used and positioned.